The prevalence of malnourishment in Madagascar is higher than it was in 1992, and acute child malnutrition is on the rise. The Malagasy people also face low and unequal access to safe water, sanitation and health treatment. These problems suggest possible failures of the government to give priority to the progressive realization of economic, social and cultural rights according to maximum available resources. CESR's factsheet (ici en Francais) on Madagascar provides a graphic overview of selected elements of the human rights to food, health and water, seeking to highlight areas where government efforts to realize these rights may be inadequate. It was prepared in light of Madagascar's appearance before the UN Committee on Economic, Social and Cultural Rights (CESCR) in November 2009. 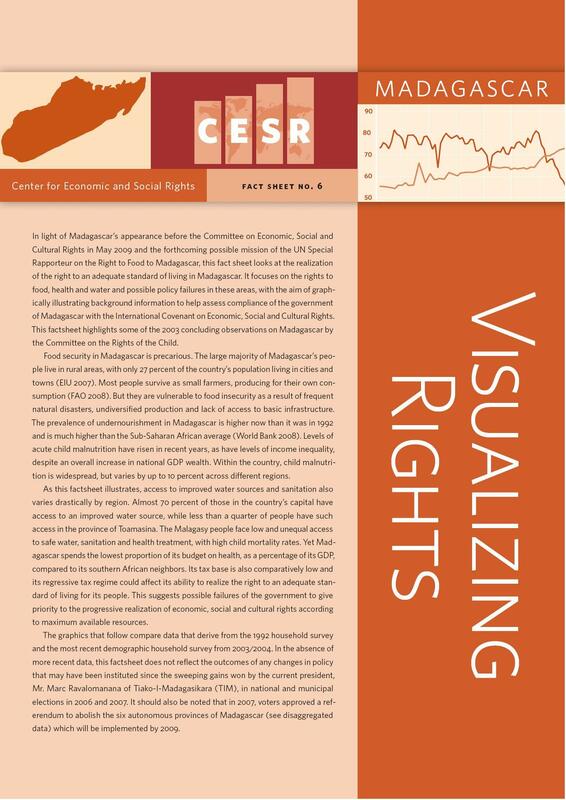 The factsheet is part of CESR's Visualizing Rights series. Each factsheet focuses on a country and its economic, social and cultural rights obligations. This focus helps enable intergovernmental human rights mechanisms, such as the UN, and national and international NGOs, monitor governments' compliance with their economic, social and cultural rights obligations. The latest available socioeconomic data is used, taken either from international sources such as the World Bank or the UNDP, or national sources, such as national statistics bureaus. This data is displayed using graphs and charts, and then analyzed and interpreted. This is meant to shed light on the condition of governments' economic and social rights obligations.